I haven’t written much lately. The hours of my days seem to be sucked into a vortex of duties. They are not unpleasant, and I begrudge nobody, but there are times, whole hours, whole days when I want to raise my hands palms-out and stop it all. I want to say, in the kindest way imaginable, “please just let me breathe. Let me grieve my loss. Let me absorb the continuous blows that, maybe a year ago, would have killed me but which I now accept as my daily bread. Permit me to abandon all pretense of grace and ease and charm just long enough to be the selfish beast that I am right now, the bottomless pit of need, a motherless child facing down the red and green barrel of everyone else’s Christmas spirit.” It’s not pretty, but it’s real. Right now, it’s real. It’s clear that she has an impairment of some kind. Although I was never sure what it was, and whether it was organic or traumatic in origin. It didn’t seem polite to ask her mother or her grandmother, and it really didn’t make any difference. I had started a Wednesday pattern of hanging out with her for a while, watching her find Waldo, or tell me about what she was drawing. She has the gentlest little voice, and radiates a kind of Buddha-like acceptance of everything around her; ten minutes with her soothed the beast within. Last night, as the three of us talked, her grandmother volunteered the information that the girl had suffered a brain tumor, and that the treatment had severely diminished her brain functioning. As the older woman talked, I noticed that the child was drawing a rainbow with the colors in their proper “ROYGBIV” order. “How does she know that?” I asked, pointing at a rainbow-covered sheet. “It’s something she remembers” her grandmother explained. “When you lose parts of your brain it’s hard to predict what will work afterwards.” The girl looked up from her drawing, focusing her big, dark brown eyes on mine. “Do you have a mom and dad?” she asked. I hesitated. I didn’t want to upset her, but it would be odd to say that I just had a father without explaining the reason. I looked to her grandmother for guidance. She knew I had only recently lost my mother. “Your mom died?” she said, selecting a handful of crayons. “I will make you a new mom.” She started to draw. 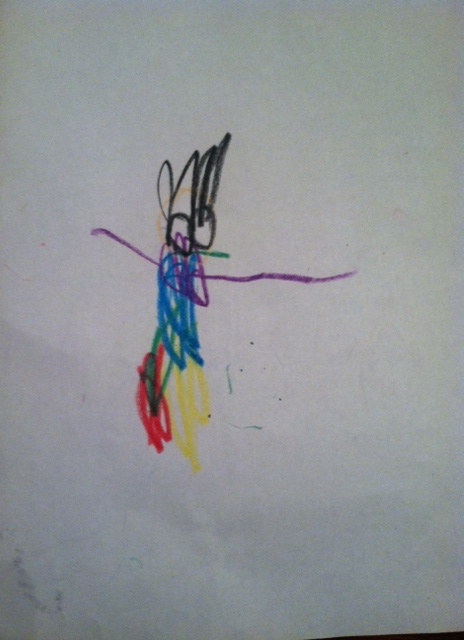 “Eyes,” she said, drawing two circles, “and legs,” she continued, adding arms and hair and other necessary mom parts. She was calm and workmanlike, as if it was no big thing to fill a gaping hole in someone’s life. When she was satisfied, she looked up at me. “Is it okay if I take it with me?” I asked. She nodded. “I made you a new mom” she said. I nodded again. “Can you write your name on it so I remember who made it for me?” She nodded again. She formed shapes on the paper, in red, orange, yellow, green, blue, indigo and violet. Well, as close as she could come with the crayons at her disposal. “Thank you” I said. She was on to more rainbows, and didn’t look up. And there are a million corny things I could say to end this – things about the triumph of the spirit, or counting my blessings, or the mouths of babes. I could say things that might make me gag a little, things that might diminish the power of a moment of true grace. But I won’t. You get it, right? Posted in life and tagged death, goodness, grief, healing, hope, loss, mourning. Bookmark the permalink. I am alarmed by suggestions that I am handling the loss of my mother with anything approaching grace. I worry that there may be people reading my words and thinking that they should be all philosophical, and find silver linings when they are doubled over in pain. I worry that I am, by shaping my stories to reflect the highest and most presentable of my thoughts, creating guilt in fellow sufferers. So this time, I will try harder to tell the truth in its most raw and unfiltered form. This is just a report from the trenches. There is no tidy wrap up at the end. If you are looking for that, for some kind of reassurance, I am not your girl today. Five weeks ago tomorrow, my mother died. Last night I found out that my father’s cancer has returned. There’s more, but the other stories are not mine to tell. These are heavy things, and by last night I was crushed by their collective weight. I went to work when I should have taken the day off. I went to work because I’m worried about losing my job, and because there is always this brisk, loud and unwelcome Puritan in my head prattling about bucking up, doing the needful, and being a Good Girl. I should have throttled her. I should have taken the day off. So after work, physically exhausted and not really in my right mind (assuming that such a thing exists) I decided that my situation called for certain numbness. Food usually works, but I was absolutely not hungry. Besides the which, my refrigerator is filled with leftovers from Monday’s memorial service, and there was an irrational wrongness in using that food to throttle the Puritan and numb my grief. This grief, you see, refused to be contained any longer by the benisons of lovely manners and native stoicism. It leaked every time I had a moment’s pause, tears flowing, breath ragged, pulse racing. So I decided that I would get drunk. This was problematic for a number of reasons, chief among them the fact that I don’t ever drink, and don’t tolerate alcohol very well. I tried, though; I mixed myself a vile combination of Crystal Light and Jack Daniels and drank it all, remembering every story I had ever heard or read about the moment when alcoholics began to feel calm, steady, and generally better. There was no click. I did not feel drunk, numb, or better. I felt as sad as I had felt before, with the additions of nausea and a death-dealing headache. I will tell you, because we’re being honest, that in those hours I thought about how it might be okay with me if I died. Nothing intentional, nothing that would upset my family inordinately; I would just make a mistake – take some pills on top of the alcohol and slip away from this brutal, vicious mess. I’ll tell you something else: I took one of those pills you are never supposed to take when you’ve been drinking. I took it to fix the headache. I was pretty sure that enough time had passed that I would not stop breathing and die, and I was also pretty sure that more than one pill would be required to knock off a person of my size. But I wasn’t completely sure. It was my own little game of roulette, a private thing in my head as I lay on the couch not laughing at TV comedies and leaking eyeliner-black tears. (That was a really long sentence – clearly part of the revolt against restraint and convention. Next thing you know, I’ll be splitting infinitives and using “task” as a verb). I just wanted you to know that while it often suits me to portray myself as a smooth, marble bust of Calm and Hope in the Face of Grief, I am frequently more like an abandoned scarf unraveling in a puddle of dirty water. Not smooth, not calm, not hopeful, just pathetically floundering around, not showering, watching hours and hours and hours of whatever appears on the television and eating dry cereal out of the box at 2:00 in the morning. And if that’s where you find yourself, I’m right there with you. And, probably, I love you. Because all of us living raw need to stick together, and make each other cocoa and read each other “Goodnight, Moon.” Because otherwise, this world is just intolerable. Posted in life and tagged death, grief, mourning, truth. Bookmark the permalink.